We've been out for the past week and haven't had the opportunity to comment here on the horrific situation on the gulf coast. First, our hearts go out to those who have lost loved ones, friends, house or possessions (although we firmly believe that earthly goods can be replaced and are at the low end of the scale compared to losing people). Katrina is the largest disaster of any scale that we have known in our lifetime, our own American Tsunami. We don't intend to put in photos of human suffering here, at least not on this first post. Lord knows that rescue and cleanup workers will be finding the dead for weeks and months to come. We have read that the Bush administration has put a hold on photos of dead bodies; we haven't formed an opinion about that as of yet except to say that it will be difficult, at best, to do a body count, especially for those poor and/or homeless who had no family to help identify them-a photo record would seem more than helpful. Who's to blame? Or is it fair to consider the "Blame Game" issue at this point? We don't like the word blame in this instance. The question should more aptly be "Who is accountable?" or "Who is responsible?". The Bush administration, in answering this question but attempting to make it a petty blame game, is not acting responsibly. 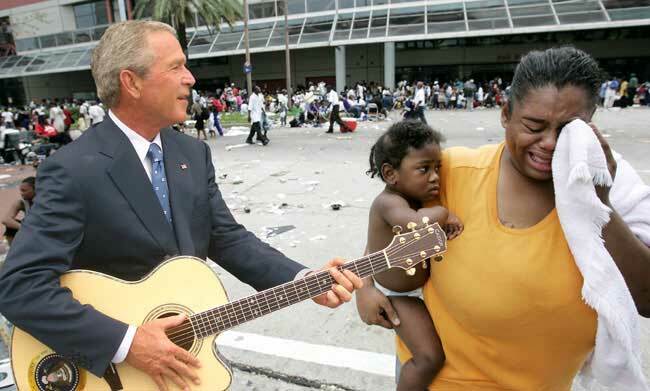 They and all who parrot the Bush administration talking points say "Now is not the time to point fingers' and that there will be time to look into this later after the immediate needs of the hurricane victims are met. An analogy of why this is itself an attempt to deflect blame from themselves. You have a car and it's not in good shape. You spend money instead on vacations or large-screen televisions. Your son comes to you to ask if he can drive the car and tells you repeatedly that it has major brake and transmission problems and may break down at an inopportune time-you give him a little money but mostly ignore his requests, because you're planning to buy a yacht. The car breaks down at a dangerous place in the road, and your son calls you to ask for help. You tell your daughter to pick him up and set up warning signs before and after the car in the road so that there won't be accidents, and you let your son know his sister is coming. But your sister, although she tells you she's going, dawdles around and doesn't do as she's asked right away (she does talk a good game). Instead of you following up to make sure that things are going well, you go out of town on some junkets. The car is still in the road, and has caused accidents and death, but you don't come back from your trip to take charge; instead you have some highly inappropriate photos taken of yourself that show your indifference and lack of leadership. Your son is frustrated because he expected his sister to come right away to help move the car out of the road, when sister finally did, she turned away people who saw what was happening and prevented them from helping. The people in that area are getting restive, angry and frustrated, and days later you realize you need to take charge and you go to the area to investigate for yourself. You find a lot of people dying, your daughter is there, but it's a horrific scene that must be fixed. We would like to no longer hear the phrase "blame game" or "finger pointing" because it trivializes the higher point of honor, which is to be accountable, take on responsibliity instead of trying to avoid "blame". The only reason we can see for doing this is because those who ought to be responsible are afraid they will be blamed, themselves. We want to see our leaders stop acting as cowards and step up to the plate and act as adults who sometimes don't do the right thing but are willing to admit it. Do they think the country isn't watching, and don't see a disconnect between the way the leaders act and the principles any parent teaches his own children?